With school break just around the corner I have a great book to share with you - perfect for those lazy days of summer reading! Nick and Tesla's Solar-Powered Showdown: A Mystery With Sun-Powered Gadgets You Can Build Yourself by "Science Bob" Pflugfelder and Steve Hockensmith. This book is the 6th in the series but can stand alone as well. In it we meet Nick and Tesla twins who have had many adventures. They have a strong knowledge of science and a lot of brain power! What I really like about his book is the doodles, pictures and experiments! Yes, experiments! My second born love science and especially hands on science so this book is perfect for him because it is interactive reading. What a fun way to bring summer reading alive! Twin sleuths and inventors Nick and Tesla have had a very eventful summer— with the help of their eccentric Uncle Newt, they’ve outsmarted foes using their knowledge of electromagnetism, robotics, and Hollywood magic. 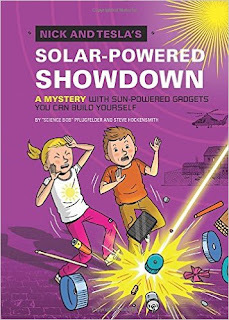 In the Nick and Tesla series’ sixth installment, Nick and Tesla’s Solar-Powered Showdown: A Mystery with Sun-Powered Gadgets You Can Build Yourself (Quirk Books; May 10, 2016; Ages 8-12) the children are back with more adventure, mystery, and DIY science projects as they set out to rescue their parents, who were kidnapped while working on a top-secret solar power research project. Nick and Tesla’s Solar-Powered Showdown also includes instructions for five kid-friendly solar-powered gadgets. “Science Bob” Pflugfelder is an award-winning elementary school science teacher based in Watertown, Massachusetts. He is the resident science teacher on Jimmy Kimmel Live and has appeared on The Dr. Oz Show and Live with Kelly & Michael. His experiments have been featured in numerous publications, including People, Popular Science, FamilyFun, and Wired. On his website (www.sciencebob.com), Science Bob encourages parents and teachers to practice “random acts of science” and provides instructions and videos for interactive experiments. Steve Hockensmith is an Edgar Award–nominated author. A former journalist, he has written for the Hollywood Reporter, the Chicago Tribune, and Newsday, among other publications, and he is the author of the New York Times best seller Pride and Prejudice and Zombies: Dawn of the Dreadfuls (Quirk Books, 2010). Steve lives in Alameda, California.